6" thru 12" Diameter Kingpinless Swivel and Rigid Casters with Phenolic Wheels - Capacities up to 5,400 lbs Per Caster, Brake Options and Swivel Lock options available on product page. 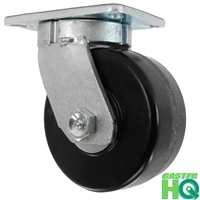 Highest quality Heavy Duty Casters at the lowest prices online. ALL PRODUCT IMAGES ARE SHOWN USING A 6" DIAMETER WHEEL AS AN EXAMPLE - ACTUAL PRODUCT WILL LOOK SLIGHTLY DIFFERENT THAN THE IMAGES DEPENDING ON WHICH SIZE ORDERED.